* Citrus and cedar is on top with a spicy basil mixed in. * Projection and strength are massive with everyone around you being able to smell spicy pencils on you. * The cedar stays as a dominant note throughout the life of the fragrance – with sweet amber and sage joining in mid development. * Once it gets to this point, it comes closer to the skin and doesn’t project too loudly. * A sweet, non-churchy incense and creamy sandalwood joins the amber in the warming dry down. Summary: Cozumel is a Carribean Island off the coast of the Yucatan Peninsula of Mexico Gorgeous warm weather and plentiful water-based activites make this tropical island a popular stop for cruise ships and vacations. This scent is definitely one that you need to test for yourself, because every other review I read makes it sound like a gorgeous tropical vacation scent. On my skin it’s a cedar bomb from beginning to end. I am not a huge fan of cedar, so it’s not something that I personally enjoy. I tried to find some link between Cozumel and cedar and the closest I found online was Cedar Pass- a scuba dive site which has gorgeous fish. Yes, I know- random. Longevity is good at over eight hours, and once you get past the initial projection this would be a nice manly, office scent (I just don’t see Cedar as a feminine note). 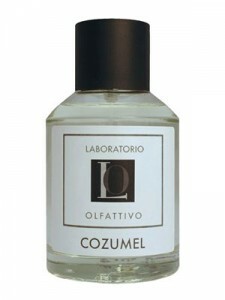 Laboratorio Olfattivo Cozumel is available at MIN New York. Disclaimer: No disclaimer needed as I own a full bottle. Image courtesy of Fragrantica website.